Jap.163 "Labyrinth of Mirrors. 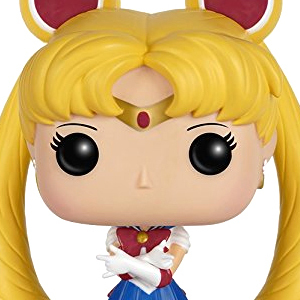 Chibi Moon Captured"
Super Sailor Mini Moon has been trapped in a mirror by Zirconia who has disappeared along with the Amazon Quartet. Sailor Moon and the others try to get her out but as Moon charges for the mirror it disappears and Mini Moon is teleported to the chamber where Helios' body is kept. As Mini Moon stands up, the Stallion Reve appears before her. She grabs it as it begins to glow. Suddenly she notices that the horn on Helios' head is glowing in sync with it and realises that the man is Helios / Pegasus! She drops the Reve in shock which dissolves and disappears forever, no longer needed. Queen Nehelenia arrives and traps Mini Moon in her spider webs. 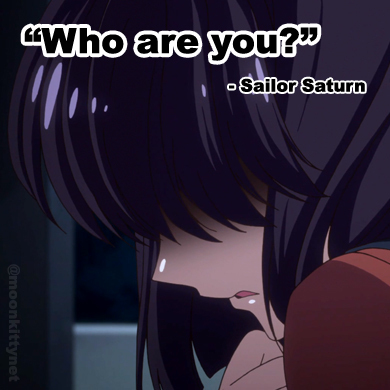 Mini Moon demands to know who she is. Nehelenia tells her the story of an dark queen who lived on a lonely planet which overlooked the Earth and the Moon. She tells of how the dark queen had heard of a powerful crystal called the Golden Crystal which could be found on Earth so she went to Earth and found the crystal which was guarded by a boy, Helios. She had offered to share the power of the crystal with Helios but he had simply explained that if the Golden Crystal has thoughts of it's own and is emotion based and that if her thoughts were not pure it would not work. As the dark queen went to touch the crystal, it attacked her with holy fire. Realising the boy was somehow connected to the crystal she kidnapped him. Queen Serenity heard of this and imprisoned the dark queen. Recently though during the eclipse the curse was weakened and she could send her minions to Earth to search for Helios' soul which had fled it's body. Nehelenia rejoices in finally having won. Elsewhere Zirconia attempts to trap the Sailor Scouts in a maze of mirrors with illusions of themselves that tempt them to give up being soldiers and have a normal life. One by one each Scout is hypnotised but eventually they all come around and remember their true dreams and their mission to protect this planet and save Mini Moon and Darien. Sailor Venus, Sailor Mercury and Sailor Moon all separately attack the mirrors with Mercury Aqua Rhapsody, Venus Love and Beauty Shock and Moon Tiara Magic which destroys them all and frees them. While Zirconia was busy dealing with the Scouts, the Amazon Quartet got bored and decided to swap Mini Moon with a doll replica. They make the switch while Nehelenia is gone and quickly summon Pegasus. They place a reign on him and he immediately begins to struggle. As they try to grab his horn he releases a burst of fire that surrounds him and causes him to panic more. Mini Moon wakes up and sees Pegasus in trouble. She runs towards him and pushes through the fire. She reaches him and rips of the reigns and gets him to relax and stop the fire. The Quartet are shocked by this selfless act and ask Mini Moon why she risked her own life. Mini Moon simply explains that she had no choice, Pegasus wouldn't have survived if she didn't help him. Suddenly Zirconia's voice booms around the room yelling at the Quartet for what they did. He traps all four of them in mirrors which teleport away to a limbo prison. The Golden Mirror then bursts from Mini Moon's chest, forcing Pegasus to return to her dream. Mini Moon collapses. In the limbo prison, the Quartet begin to wonder if they're on the winning side. This was the first time Super Sailor Moon would use the attack, Moon Tiara Magic and the final time it would appear in the anime series but she would use it again in Sailor Moon SuperS The Movie: Black Dream Hole.